Ats, tribal, festival and flamenco flare pants in burgundy, black and red velvet choices. The following three are made up at this time. Photos show all three colors. Waist/upper hip: 27" - 31"; un-stretched 27. Front rise about 9" -10". Back rise about 13 - 14. Other sizes - i have more of the red and black velvets so please convo me and i would be happy to make one up in your size and for your height. Alterations: to have pants shortened and/ or a side split added let me know via the checkout note. Dark green flares in multiple sizes are available in this listing. 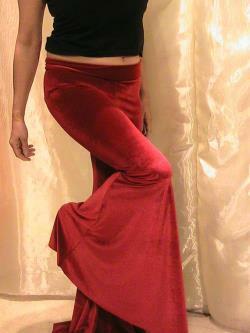 Pants are made of super soft luxurious stretchy heavy weight velvet in striking deep rich colors. These velvets are cool and comfortable next to the skin and flows and moves beautifully to reflect a dancers movements. Flares starts about 14"-15" below crotch level. Snug fit from hips through thighs. That 3 inch broad fold-over style waistband seam is reinforced with serged elastic and can be folded over to lower the front rise by an additional 2 inches. Edges are lettuce leaf hemmed with dark thread. Wash: hand wash or cool wash in machine and dry on gentle cycle. Good to dance in or to wear to the grocery store. Stretch velvet pants are such a classic and they work for so many lifestyles and dance styles including tribal, hoop dance, fusion, latin, and cabaret style belly dance. Add a glittering bra and belt set to complete an ats or cabaret style belly dance performance costume. Doubles up as evening pants with a pair of pretty heels and a glitzy top. A guaranteed head turner at any festival or fete.